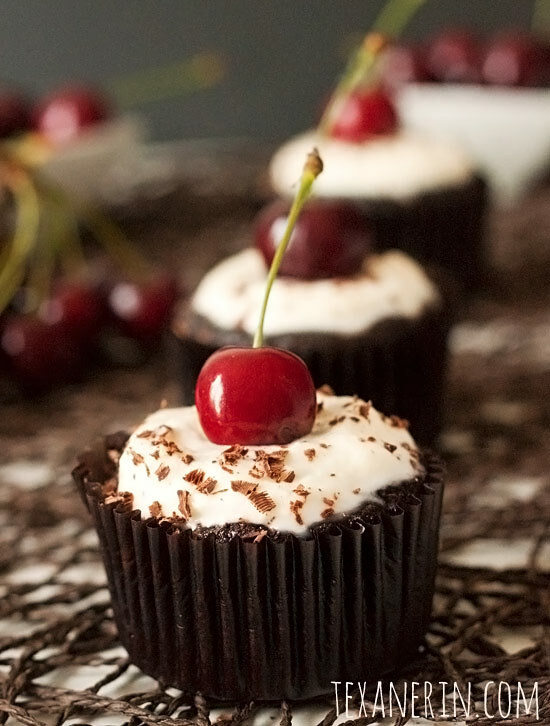 Black Forest cupcakes made healthier! Cherry filling and lightly sweetened whipped cream transform these ordinary gluten-free chocolate cupcakes into something truly special. 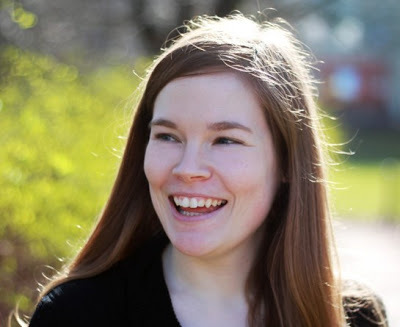 I’ve been living in Germany for four years and I’ve had this blog for half that time. But still, I’ve never made anything German on this blog other than this Eierlikör, which is egg liqueur and also know as Advokaat. I’m just not a big fan of German baked goods (other than the bread). But told hen it struck me – I can adapt German goodies so that I do like them! 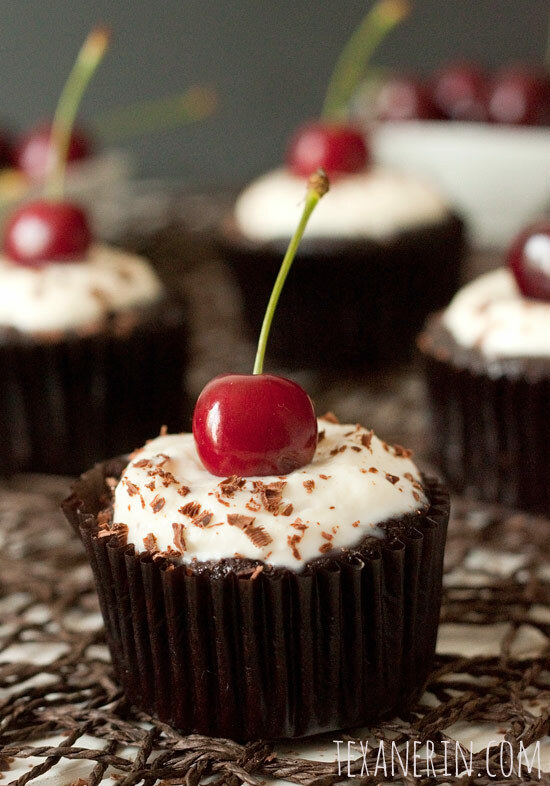 So first up we have these Black Forest cupcakes. I don’t do layer cakes. They’re way too fussy and Black Forest cakes especially just have way too much whipped cream for my liking. So I adapted my grain-free spiderweb cupcakes. I made them less spidery, obviously, added a cherry filling which is just cooked cherries and honey, and a little whipped cream. German law requires that Black Forest cake contain Kirschwasser, a type of brandy distilled from cherries. That’s right. They regulate their cakes. I could have gone out and bought some but I was too lazy for that. So… sorry. These aren’t authentic! But neither is the cupcake part or the gluten-free part. And you should apparently use sour cherries, but all I had was sweet. It worked out fine but use sour if you have them! Preheat oven to 350°F (175°C) and line 8 muffin cups with paper liners. Mix together the wet ingredients in a medium bowl and set aside. In a smaller bowl, combine dry ingredients together and add this to the wet ingredients. Stir just until combined and be careful not to overmix! Pour the batter evenly into the 8 paper liners. My liners were a little less then 2/3 full. Bake for about 16 minutes or until a toothpick inserted in the middle of a cupcake comes out mostly clean. Moist crumbs and a little stickiness are okay - just not raw batter. These are incredibly moist so if the toothpick comes out totally clean (like a normal cupcake), they're probably overdone. Put the cherries in a medium saucepan and smash them with the bottom of a glass. Add the honey and lemon juice and stir until combined. Use a paring knife to cut out a section of the cupcake, about 1 inch into the cupcake. Set these cut out portions aside. Fill the cupcakes with the filling. To prevent the cherry filling from bleeding, I cut off just the top part of the cupcake cutouts and placed it back on the cupcake. For the whipped cream, beat the whipping cream and powdered sugar in a bowl until stiff peaks form. Spoon this onto the top of the cupcakes. Add grated chocolate and a cherry right before serving. Store covered in the refrigerator for up to 4 days. These are best enjoyed cold. 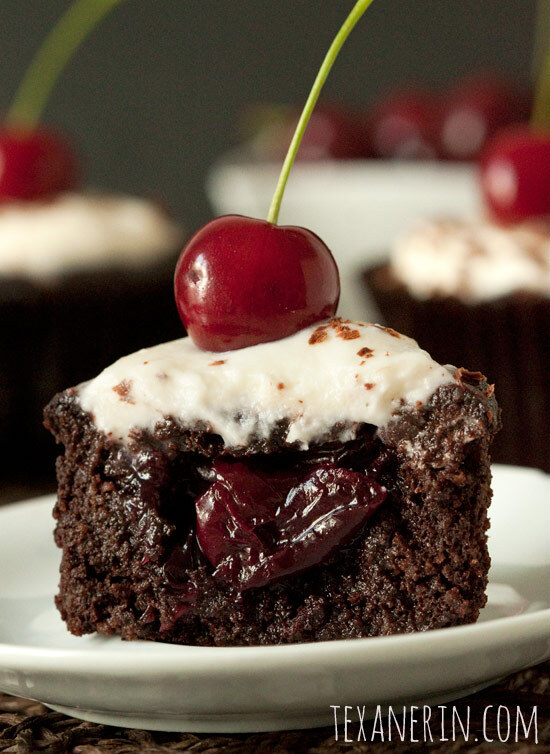 44 comments on “Black Forest Cupcakes (grain-free, gluten-free, dairy-free)” — Add one! Hi Tina! I’m so sorry for just now seeing your question. I’m happy to hear that you enjoy the recipes. :) What do you normally use as a sub for applesauce? I just googled it and I see people suggesting other fruits (like pureed pear or banana) but I worry that you’d be able to taste them in this recipe. Sorry I can’t be more of a help! It looks awsome, I would love to try. But the problem is that I’m living in Hungary and we dont have apple sauce here. How can i manage it ? Do you have any ideas? I actually live in Germany so I totally understand! They have so many more options for everything in the US. It’s frustrating! By the way, I forgot to say that I posted another version of these cupcakes with a tad bit more sugar (and I think they’re yummier that way :)) They’re here: paleo chocolate cupcakes. And I also forgot to say that it could be that almond flour = ground almonds in Hungary (like in Germany). I’m happy to help! I know how difficult it can be to make recipes from the US with European ingredients. ;) I hope you’ll enjoy the recipes! 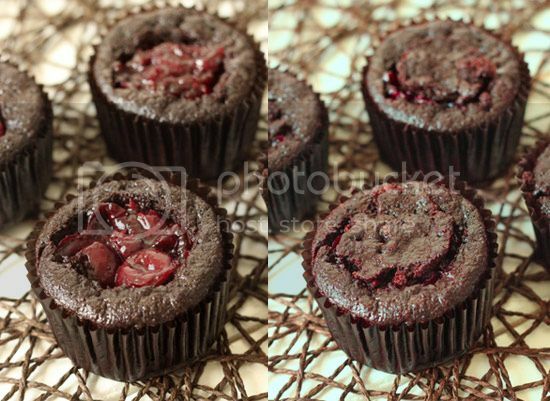 I love the pic at the end of the body of the post – with that big, huge, juicy cherry staring out from inside the cupcake! Gorgeous shot for such a great recipe! I’m usually a little suspicious of gluten-free desserts (I love me some gluten, and sometimes gf desserts are…funny) but these cupcakes look amazing! The texture of the cake looks so fudgy and dreamy. 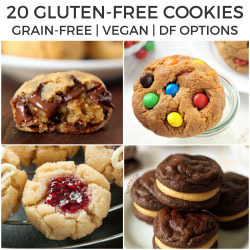 You may have changed my mind about gf desserts! Haha. Just had to clarify! Erin, I’m in love with the filling! These look so good. Oh man do these look so delicious, Erin! Love that cherry oozing out of the center! Soooo scrumptious. Oozing cherries. Yeah! :) Thanks, Georgia! Can I replace coconut oil with butter? These look heavenly!!! Love, love, love this recipe! Black forest cake is a favourite with both my dad and my hubby – these are gorgeous, and I love the healthier adaptation! I don’t care whether they’re “authentic” or not, they look fabulous! And you’re so right about the baked goods over there, so many of them looked so good but when you actually indulged, they just weren’t great. Oh I love these, especially that honeyed cherry filling! Yum! I’m such a huge fan of the combo of chocolate and fruit, though I’m not sure I’ve ever had Black Forest cake. I clearly need to remedy that, these look amazing!! Hi there! I love love love your blog and I have passed it along to SO many people. You’ve helped a lot of people enjoy food again that have gluten/grain problems! Any way, I’m wondering what can be substituted for coconut oil? I plan on getting some but in the mean time, I really want to make these for my gluten free neighbor and cant run to the store for a week. Suggestions?? …never mind. I checked some of your other posts and found my answer :) thanks!! Aww, thanks Andra! What a nice comment. :) I’ve read that sometimes coconut oil and butter isn’t interchangeable. Other people say that’s not true. So I usually only list coconut oil and not butter as a sub if I’ve only tried with coconut oil. I’ll have to do more research on the topic. Thanks again for the nice comment and I hope the cupcakes came out well!